As I crawled the web, I discovered the The Magnetic Mineral Springs, many of whose visitors arrived at the 1870 Saginaw Valley & St. Louis Railroad Depot. Then there was the more recent phenomenon of the Old US-27 Motor Tour, and, not least, The Political Roots of the Forward Pass. But, I digress. 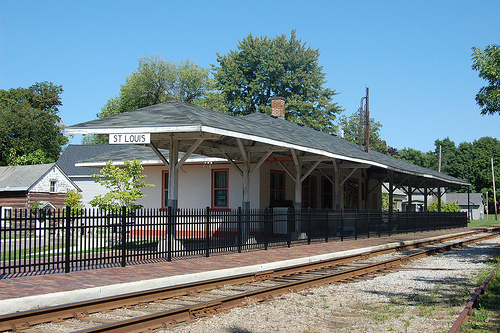 The October 13 meeting will feature a presentation by Dave McMacken on the historic depot and passenger railroads in St Louis, with ample time for questions. Dave is a local historian and author of two books: St Louis at 150 and Saratoga of the West. His presentations are well researched and entertaining. Plan to arrive early so you can look over the museum exhibits housed in the depot. You will enjoy the grounds with new sidewalks and a station platform redone several years ago with an MDOT Transportation Enhancement Grant. An auxiliary exhibit building was constructed, as well, at that time. 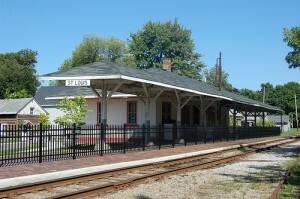 A local foundation paid for repainting of the stucco station building in 2011. We will be lunching at the River Rock Bar& Grill on Mill Street in downtown St. Louis. You may wish to spend the rest of what we hope will be a lovely fall afternoon exploring St. Louis. Or you may wish to take the suggestion of Rosemary Horvath, our new East/Central Regional Chair, and make the short drive up US-27 to take a look at the Clare Depot which is being restored. See Rosemary’s article in the issue of ON TRACK that was sent to your inbox early Thursday.